As an outspoken believer in the Second Amendment, it infuriates me to no end when I see liberals use tragedies as an excuse to demand the government strip away our right to own assault weapons. This ludicrous and short-sighted notion, that we should willingly part with our God-given freedom to defend ourselves by any means we deem necessary, is a reaction based in fear, and that mode of thinking will only lead to handing victory to our enemies. Quite frankly, if we ban the AR-15, we might as well admit that the seagull in my front yard has won. 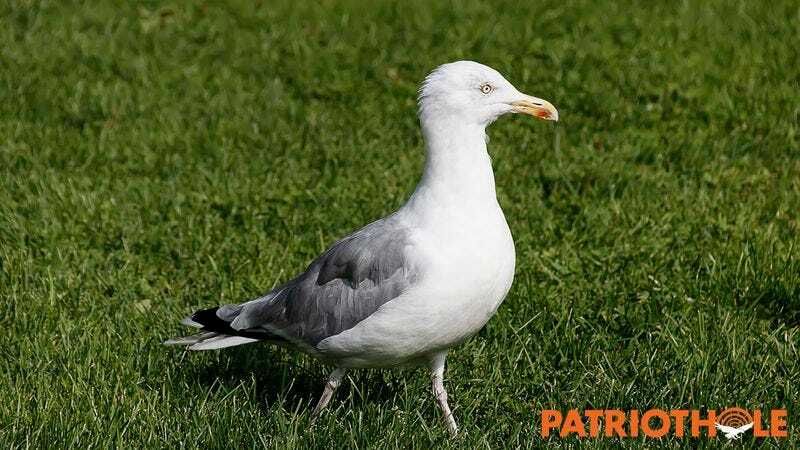 The Left’s ignorant call for a total prohibition on the sale and use of semi-automatic rifles by American citizens fails to consider the crucial role that these guns serve in defending my lawn from the aggressive, territorial seagull that struts around in front of my house and makes me afraid to walk across my own yard. As an average American with a family and home to protect, I rely on my AR-15 to remind the seagull that he’s on my property, and that there are consequences for biting my legs every single time I try to walk to my car. Giving into liberals’ uninformed whines and demands over gun control would amount to nothing more than serving a win to the seagull on a silver platter. It’s utterly shameful that so many people’s first reaction to a mass shooting is to throw their hands up and surrender our best line of defense against the seagull that chases my wife back inside the house every time she attempts to go to the grocery store. What infuriates me the most is that the Democrats calling for the wholesale ban of semiautomatic weapons seem unwilling to acknowledge that the seagull is far, far too agile to be stopped with a handgun. Yes, it’s true that AR-15s can be used by evil people to commit heinous murders, but we should not use the monstrous actions of a few individuals to demonize responsible gun owners who just want to defend their yard from the belligerent seagull that squawks at deafening volumes all night, every night and lays its eggs in the gas tank of my car. If we ban assault rifles for all Americans just because of the abhorrent violence committed by a few individuals, then we might as well build a tiny throne on my lawn for the seagull to sit on; give him a tiny, golden, seagull-sized crown; and start referring to him as “His Majesty, King of the Lawn,” because we’ll pretty much be handing him total dominion over my yard. What infuriates me the most is that the Democrats calling for the wholesale ban of semiautomatic weapons seem unwilling to acknowledge that the seagull is far, far too agile to be stopped with a handgun. Any liberal who suggests that a simple handgun or hunting rifle “should” be enough for self-defense is willfully ignoring the fact that every time I open my mailbox, the seagull bursts out of it at blinding speeds and launches an aerial assault on my face and eyes. If liberals think a glock can provide effective firepower against this lightning-fast creature of the sky, they have completely lost touch with reality. What’s next after banning the AR-15? The katanas I hurl at the seagull through my living room window? The 18-wheeler truck that I barrel into my front yard to try and run the seagull over? The land mines I’ve planted near my sprinklers in the hopes to explode the bird the next time it drinks from one of them while staring menacingly at my wife? This slow but steady capitulation to the seagull’s demented whims is the only logical conclusion of the Left’s agenda. Making AR-15s illegal is a surefire way to render myself wholly subservient to the will of the seagull, and I, for one, believe that goes against everything our country stands for. Living in fear of the seagull on my front lawn is a far worse fate than dying free. We cannot let it come to that, and any step towards taking guns away from Americans is a step in the worst direction we could possibly take.